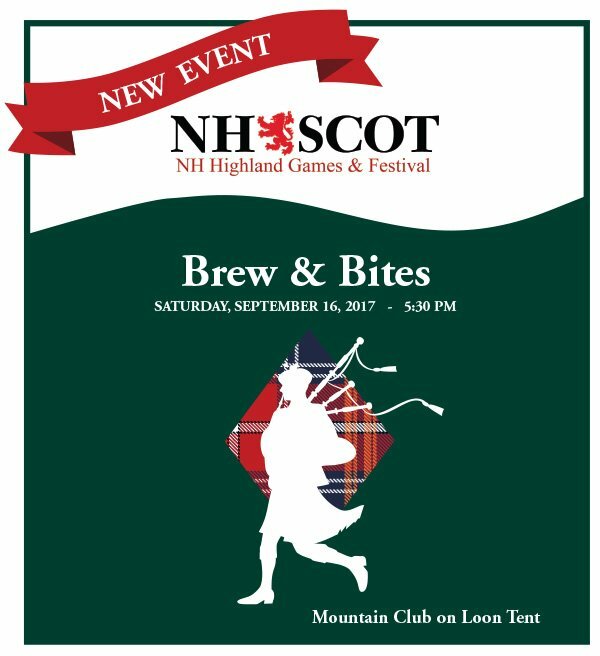 Get your kilt on and head to the NH Highland Games Brew & Bites Dinner Event. The Brew & Bites is the newest addition to the Highland Games. It will be hosted by the Mountain Club On Loon Resort on Sept 16th at 5:30. We have a giveaway for 2 tickets to this event at the end of this post! The NH Highland Games is a top notch event weekend. People come from all over to experience the games, challenges, comradery, food and drink. The Brew and Bites dinner event is a perfect addition to the weekend, bringing with it a rich atmosphere of craft beer and great food. Some of the foods your pallet will welcome are Hearty Beef and Barely Soup, Roasted Lamb Leg, Corn Beef with tender carrots, Bread Pudding, Apple Crumble and so much more. Let’s not forget about the brews of choice- Great North Ale’s RVP (Robust Vanilla Porter), Innis and Gunn’s Original Scottish Beer, and many more that will pair perfectly with your food courses. This event is coming soon, meaning you better grab your tickets really soon! The Highland Games is already popular, adding this great dinner event to it will surely make this event a sell out! Have a blast! Grab your tickets HERE! Thanks to Mountain Club On Loon, they have given us two tickets to give away to our readers! Enter for your chance to win HERE!